As one of a select number of invited guests, Eurovisionary were fortunate enough to be able to attend the launch of Magne Hovden’s book, Melodi Grand Prix yesterday. We were promised an evening of glitter and glamour with one or two surprises and publisher Aschehoug certainly didn’t dissappoint. The event began at 7 pm with about 50 people present, consisting of both press, fans and writers. The function room was kitted out accordingly with plenty of flags and decorations to get people into the spirit of things. After an hour or so the proceedings got underway with a short presentation and reading of a short excerpt from the book before Helene Bøksle, one of the hotly tipped favourites took to the floor and treated all present to a stunning performance of a traditional Norwegian song, reportedly 1000 years old. With crystal clear tones it was obvious that her voice gave many among the audience goosebumps. Needles to say, her number was ecstatically received by the enthusiastic crowd. Melodi Grand Prix figurehead at NRK Per Sundnes also graced us with his presence and he had brought along a few of the artists competing in Saturday’s final with him, namely The Lucky Bullets, Helene Bøksle and Hanne Sørvaag. Last year’s entrant Didrik Solli-Tangen was also in tow, looking as dashing as ever. Per was invited to take the floor as he was presented with an award from the publisher for being a "great all-round guy". The main character in the film is to be a washed out singer looking to make a comeback along with his group The Vikings. They have a burning desire to win Melodi Grand Prix and go on to win the Eurovision Song Contest. 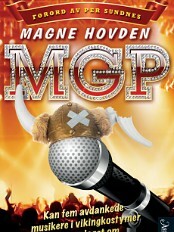 The singer, Hovden reveals, will be a character that everyone can relate to and will find endearing. The enthusiastic writer also goes on to tell of his plans to try and get Norwegian celebrities involved in the project Rolf Løvland, amongst others. Per Sundnes would ideally accept a cameo role in the film, alongside other household names. Sundnes has also contributed to the novel, writing the foreword and was also instrumental in assisting Hovden’s research into the contest, providing him with ample material. Glitter and glamour came in the form of a Eurovision mini drag show, with four acts competing under the auspices of hostess Comtesse von Lüderlitz – not as funny as anticipated but extremely entertaining nonetheless. Attention then turned to The Lucky Bullets, who had brough along both snaredrums, contrabass and guitars and held a mini concert consisting of about 6 rockabilly numbers. They even managed to get Hanne Sørvaag up alongside them to perform Dolly Parton’s Jolene and 9 to 5, the latter being a sort of extra number, as the audience lapped up her sterling performance. The event drew to a close at around 10 pm and it was a thouroughly enjoyable evening with a great atmosphere. Eurovisionary wish Magne Hovden every success with his new book and hopefully the plans of creating a film from his novel will be realised.